NEW YORK, NEW YORK (December 4, 2018) — New Monuments for New Cities, A Buffalo Bayou Partnership and High Line Network Public Art Project, is a new collaboration between industrial reuse projects in North America. New Monuments for New Cities is a public art exhibition that will travel across the United States and Canada throughout 2019. Five urban reuse projects, which are part of the High Line Network, invited five of their local artists or artist groups to create proposals (that can take the form of posters, video projections, etc.) for new monuments. Each participating location will produce an exhibition of the 25 artworks, specific to their site. Participating artists include: Houston, TX – Regina Agu, Jamal Cyrus, Sin Huellas artists: Delilah Montoya and Jimmy Castillo, Phillip Pyle, II, Nick Vaughan and Jake Margolin; Austin, TX – Nicole Awai, Daniela Cavazos Madrigal, Teruko Nimura and Rachel Alex Crist, Denise Prince, Vincent Valdez; Chicago, IL – Eric J. García, Tonika Johnson, Chris Pappan, Richard Santiago (TIAGO), Zissou Tasseff-Elenkoff; Toronto, Canada – Susan Blight, Coco Guzman, Life of a Craphead (Amy Lam and Jon McCurley), An Te Liu, Quentin VerCetty; New York, NY – Judith Bernstein, Guerrilla Girls, Hans Haacke, Paul Ramírez Jonas, and Xaviera Simmons. “As memorials to the deeply imbalanced history of the Western world are being torn down, the current moment demands critical thought and creativity about the monuments that adorn our cities. These proposals from today’s artists offer an inspiring range of vision for how we might eternalize this point in society’s progress,” says Cecilia Alemani, the Donald R. Mullen, Jr. Director & Chief Curator of High Line Art. New Monuments for New Cities begins with Houston in February and ends its run on the High Line in the fall of 2019, coinciding with the annual convening of the High Line Network. This fifth assembly of the High Line Network will be its first public symposium, to be held in New York City, and will bring together experts, practitioners, and leaders from across North America working to expand the developing field of infrastructure reuse. Local supporters of New Monuments for New Cities at Buffalo Bayou, Houston, include East River, a Midway development and Susan Vaughan Foundation. 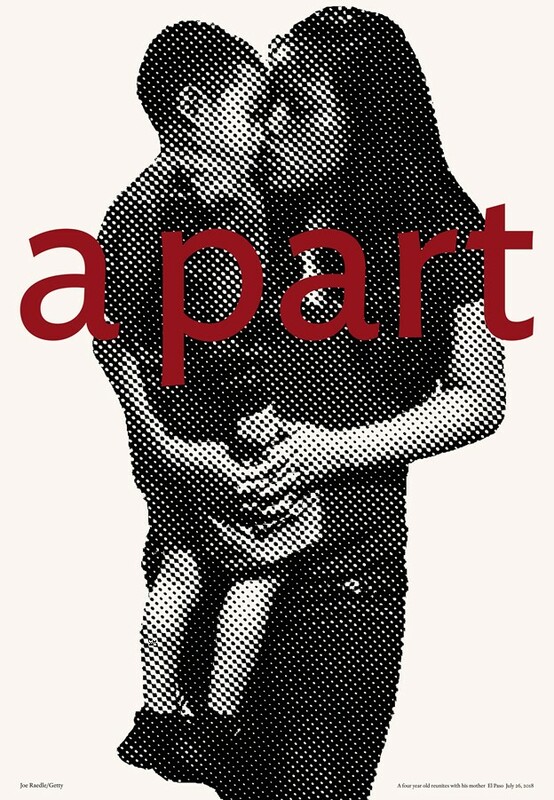 “[A] part” is a monument to the families holding steady as they are pulled apart. Sun Huellas is composed of Mexican, Chicana/o, and American participants formed to reveal issues of borders, migration, detention, and deportation in the United States. The work is for a project called New Monuments for New Cities by the nonprofit Friends of the High Line. It is a public art exhibition in which artists were asked to imagine new monuments. Their designs, on posters or on renderings that will be projected, will travel to five cities in the United States and Canada next year, to be displayed in industrial reuse spaces, beginning inBuffalo Bayou in Houston in February, and ending on the High Line in New York in October. Presented by Friends of the High Line, the High Line Network is a group of industrial reuse projects—and the people who help them come to life. As cities become denser and land for traditional parks becomes scarce, citizens are finding creative ways to bring greenspace to their neighborhoods. Projects in the High Line Network transform underutilized infrastructure into new urban landscapes. Redefining what a park can be, these hybrid spaces are also public squares, open-air museums, botanical gardens, social service organizations, walkways, transit corridors, and more. The High Line Network is made possible by the founding support of The JPB Foundation. Presented by Friends of the High Line, High Line Art commissions and produces public art projects on and around the High Line. Founded in 2009, High Line Art presents a wide array of artwork including site-specific commissions, exhibitions, performances, video programs, and a series of billboard interventions. Led by Cecilia Alemani, the Donald R. Mullen, Jr. Director & Chief Curator of High Line Art, and produced by Friends of the High Line, High Line Art invites artists to think of creative ways to engage with the unique architecture, history, and design of the High Line, and to foster a productive dialogue with the surrounding neighborhood and urban landscape. Lead support for High Line Art comes from Amanda and Don Mullen. Major support for High Line Art is provided by The Brown Foundation, Inc. of Houston, and the Charina Endowment Fund. High Line Art is supported, in part, with public funds from the New York State Council on the Arts with the support of Governor Andrew Cuomo and the New York State Legislature, and from the New York City Department of Cultural Affairs in partnership with the New York City Council, under the leadership of Speaker Corey Johnson. For further information on High Line Art, please visit thehighline.org/art. Established in 1986, Buffalo Bayou Partnership (BBP) is the Houston nonprofit organization transforming and revitalizing Buffalo Bayou, the city’s most significant natural resource. Thanks to the generous support of foundations, corporations, individuals, and government agencies, BBP has raised and leveraged more than $150 million for the redevelopment and stewardship of the waterfront. The organization develops award-winning projects such as the $58 million Buffalo Bayou Park, protects land for future parks, constructs hiking and biking trails, and operates comprehensive clean-up and maintenance programs. BBP also seeks ways to activate Buffalo Bayou through pedestrian, boating, and biking amenities, volunteer activities, permanent and temporary art installations, and wide-ranging tours and events.